← Have you won a 1.3kg bag of Rockin’ Green laundry detergent? Hello everyone. 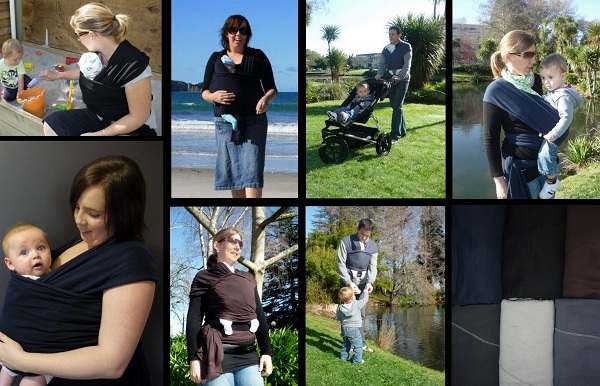 We’re on the countdown to New Zealand Babywearing Week (10 – 16 October 2011) and are looking forward to celebrating with you. Over the next couple of months we’ll be offering some fantastic giveaways. The next giveaway will be drawn once we reach 400 page members over on the New Zealand Babywearing Week facebook page. Our 400 liker giveaway sponsor is Snuggle Bug Carriers. One lucky ‘New Zealand Babywearing Week Facebook page’ member will be randomly drawn to take home a Navy Blue Snuggle Bug stretchy wrap. (Open to NZ residents only). Snuggle Bug wraps are made here in New Zealand from 100% cotton which has been milled in New Zealand. The natural fabric breathes keeping you and your baby cool in warmer climates. There are many benefits from carrying your baby in a wrap. Babies who are carried tend to nurse better, sleep better, and cry less. Snuggle Bug wraps are designed to distribute baby’s weight across the wearers body, making babywearing comfortable, especially for carrying baby for extended periods of time. Baby will sleep easier and longer as they are close to the sound of your heartbeat. Snuggle Bug wraps are a one size fits all carrier and are suitable for carrying babies from newborn till about two years of age. Leave a comment under this post to let us know why you would like to win a Snuggle Bug stretchy wrap. This entry was posted in Giveaways, New Zealand Babywearing Week and tagged babywearing, competition, giveaway, New Zealand Babywearing Week, NZ Babywearing Week, Snuggle Bug, stretchy wrap. Bookmark the permalink. I would like to win a Snuggle Bug stretchy wrap as it seems like such a natural thing to do for your child to have them close to you. Also as I don’t drive I will be doing a lot of walking and would love to be able to carry my baby (due October) rather than have it in a pram all the time. I am pregnant due in nov with baby number two. I havent got a babycarrier or cant afford them. I am a struggling solo mum on the dpb. It would be an awesome help as I have no transport to get to town with 2 kids. We dont have public transport. I would love to win a snuggle bug wrap as with #3 on the way and soon to be 3 under 4 it would be a great convenience to have two hands still spare for the other children while out shopping and I love the wraps they are gorgeous! I would love to win a snuggle bug baby wrap to give to my sister as a present. She is due with her 2nd baby in October and could really do with the wrap to feed baby hands free while dealing with her little 1 yr old very active toddler. She is umming and ahing over if she should breastfeed or not because of having 2 children under 2 years of age will make it too hard. Bottle feeding is looking much easier for her. I believe she wont have this problem if she can snuggle her baby in a snuggle bug wrap 🙂 I would REALLY love to help her out with this. I would love a snuggle bug wrap! I’ve been wanting something like this since my daughter was tiny! (she’s now 2 + 1/2!) But I would love one for my son who is 11 months and loves to be carried everywhere! Mama gets tired arms! I would love to win a snuggle bug baby wrap as I work as a teacher of teen mums who are studying to complete their qualifications while also caring for their babies. I would love to be able to give them a wrap that means they can keep their baby close while also being able to have their hands free to do their school work. It would also mean they don’t need to spend money on a pram, which is often well beyond what they are able to afford. Babywearing is so beneficial and will support them to create a wonderful bond with their babies. id love to win cos i love being close to my boy (and he loves it too over everything else ) and with him being my last (#5!!) im more than keen to wear him!! itl def help too as i have 3 under 3, and 5 under 7! I would LOVE to win a Snuggle Bug Stretchy Wrap as I am expecting bubbaloo #3. I am coach preschool gymnastics and some of the parents of the preschoolers i teach have their younger children in the wraps which leaves their hands completely free to support and assist their active preschooler as they develop foundation movement skills and explore their bodies abilities. What I really love is that while the older child reaps the benefits of the gymnastics class the babies are getting the benefits of being cuddled so close to their parent, I see it as a win win situation. The snuggle bug wrap is the ideal way for me to carry on coaching after this bub is born. With a new baby on the way I’d love to be able try open of these out. Will make having 2 under 2 easier everyday! I would love to win a snuggle bug wrap to carry my little man close by me and to free up my arms to do other things!